Twenty26 isn’t just a little bit special. It’s really, really, special. Not only is it a world class luxury ski chalet; a trusted favourite of The Telegraph newspaper, and occasional location for Snow & Rock photoshoots. It is also the birthplace of The Boutique Chalet Company. terracotta tiles and a lack of light. The estate agent told us it would never be ‘chaleureux’—literally warm, but she also meant it would forever be unwelcoming. We disagreed. We knew as soon as we stepped into the property that whilst the interiors and the small windows were a problem, the physical spaces were huge, the views from the large balcony were expansive and the potential to create a very special property was certainly there. The location of Twenty26—in the stunning Vallee de la Manche—was also very special indeed. Just out of the main town, yet moments from a ski lift, with hiking and biking trails on its doorstep—it felt like a hidden, unexplored valley. We started by developing the top three floors of the property, creating a large, open plan living and dining area, inserting large glazed sliding doors across the whole length, giving access to the balcony and bringing those impressive views to the fore. Upstairs, we tore down all internal walls and redesigned the layout to give four spacious en suite bedrooms, retaining the wooden beams and adding roof windows to bring in light and yet more of those views. By the time we opened for our first clients in Dec 2012 we felt we had reached our initial goal. The critics felt the same way. So, we ploughed on with the purchase, and our plans for a complete transformation. Back in 2012 our initial preoccupation for the space was to create something that matched the likes of Verbier and Courchevel. We needed to at least match the bar before raising it! VIRTUAL TOUR Twenty26 is set in an idyllic location, between the centre of town and the beautiful nature reserves of the Vallee de la Manche. The chaletâ&#x20AC;&#x2122;s grounds stretch out over an acre of land and enjoy fantastic views of the Morzine ski slopes and the Dents Blanches mountain range. Set over 4 floors, spanning more than 335m2, the chalet comfortably sleeps 12 guests across 6 en suite bedrooms with a main living area over 50m2 with full height glazing and a wraparound balcony. With its own Bamford Spa, swimming pool, private bar, cinema and wine vault, Twenty26 boasts all the features of a luxury boutique hotel, with the intimacy of a private residence. Fire Pit Nights Set in its own grounds, with uninterrupted views of the mountains, Twenty26 is the perfect place for evening aprĂ¨s. Snuggle under blankets around your fire pit, regaling stories of your day on the piste; enjoy your own playlists on the in-chalet Sonos system. Now is the time to really indulge in that famous BC wine list, a veritable world tour of the finest hand picked wines. In the distance you will see the peaks of the Valley de la Manche (have you conquered that off-piste yet?) and the sun setting behind the slopes of the Pleney. Bamford Spa Bamford and Boutique are the perfect collaboration, a harmonious partnership built on shared principles and goals. Nowhere is this more apparent than Twenty26. The in-chalet Bamford Spa is indulgent, with an entire floor dedicated to your well-being and relaxation. On the outdoor deck you can swim in the countercurrent heated swimming pool, enjoying the meditative pleasure of swimming lengths, perhaps relax those muscles in the sunken hot tub, or detox in the cedar barrel sauna. A covered walkway takes you inside, where you can refresh yourself under the hydrotherapy shower, washing away any hint of the day, or heat things up in the Hammam before stepping into the Bamford treatment room. Our Bamford therapists offer a range of Bamfordâ&#x20AC;&#x2122;s organic and botanical treatments, with essential oils personalised for your own particular needs. Swedish and deep tissue massages ease your muscles and improve oxygen uptake and healing after a day on the piste. Or opt for something more relaxing and restorative, to help settle you for a healing night of sleep. Your Very Own Private Members Club The Four Bottles Bar is like your very own private members club where you get to decide who to let in. Your private in-chalet bar serves fine wines, craft beers, select gins and spirits, and our very own BC Signature cocktails. Itâ&#x20AC;&#x2122;s the perfect destination to start your evening at BC, or perhaps to end your ski day. Get dressed up after your day on the piste, or your afternoon in the Bamford Spa, and schmooze your nearest and dearest over champagne, before retreating upstairs to enjoy a dining experience from your private chef. After dinner, why not come back and enjoy a small digestif? You could even take your drinks out on the deckâ&#x20AC;&#x201D;the fire pit awaits to keep you warm. 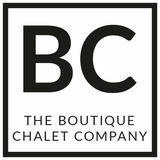 The Boutique Experience As part of our Luxury Collection, Chalet Twenty26 is an exceptional ski chalet, one of the finest properties in the resort. To complement the superb accommodation and facilities you can expect to be looked after by a team of highly trained professional staff who have been carefully selected to deliver our highly-regarded service package. Champagne corks pop on your arrival, with a Ruinart Champagne welcome reception and an introduction to your chalet team who include a chalet manager, assistant manager, professional chef, driver and housekeeping team. Following a tour of the fabulous chalet facilities there will be plenty of time to relax and settle into your room. Sumptuous beds, Egyptian cotton linen from The White Company and indulgent organic and botanical bathroom products from Bamford are our standard. When you emerge, rejuvenated, from your room and head for the dining table, our luxurious catered package is one of the most innovative in the industry. Guests can enjoy our signature dining concepts such as Kaiseki—our Japanese multi-course dining experience—and our critically acclaimed Breakfast Club—the finest way to start any day. Drinks are available from our Four Bottles Bar featuring fine wines, craft beers, select gins and spirits and our own cocktail menu. Each day your driver is available from dawn to dusk to whisk you to and from the ski slopes or the village centre, so there is never a need to walk in ski boots. Our après ski chauffeur service means your comfortable shoes can even be brought to the bottom of the slopes for you! 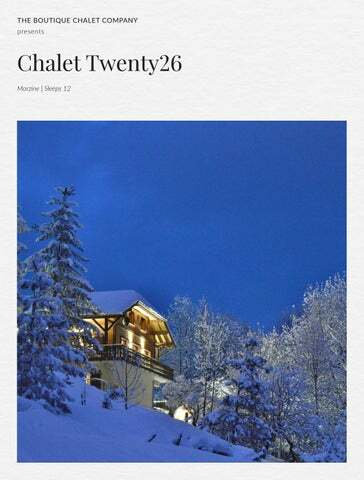 Chalet Twenty26 is available on a fully-catered or B&B basis, for exclusive use of the whole property, or during certain weeks on a Boutique Week (room-by-room) basis. Step inside the wellness suite at Twenty26 and you will discover your very own private Bamford Spa. Our partnership with Bamford is one born out of shared values and beliefs. It’s a collaboration that we are very proud of. Bamford is about the simple pleasure of quality. Since 2006, this philosophy has created the purest body care and spa range using only organic and botanical ingredients. Bamford are committed to making truly natural products using the best artisans from around the world. Bamford is authentic luxury—serene, timeless and pure. Bamford’s organic and botanical facials and body massage treatments are individually crafted and deliver a truly relaxing experience in order to unwind after a day in the mountains. It is easy to forget in the midst of a ski holiday that there are other equally exciting things to experience. In reality, such is the plethora of non-ski activities, they warrant an action-packed week’s holiday of their own. Morzine village offers a wealth of such experiences that happen well away from the slopes. From snowshoeing to hidden restaurants away from the crowds to parapenting with or without skis, there is so much to do here... If you already know Morzine in the winter then it will be yours to rediscover in the summer and your love affair may even fall for the warmer season as summer opens up, not just the mountain, but the entire region. The natural beauty is astounding, as are the gifts the mountain gives you in the form of waves of colourful flowers to marvel at, cool freshwater lakes to swim in and weather to warm your soul. When you’re not out exploring the vast playground that is the Portes du Soleil we know that being back home at Twenty26 certainly won’t disappoint.